We know here at CubbyKraft that we are a trusted source of outdoor play toys for kids. Parents have told us how much their kids love their cubby houses and forts. Their children spend every day enjoying their backyard toys so much and get many benefits from them, including exercise and healthy life lessons. Well, now we have a range of indoor kids furniture called Playlock that we know your children will love just as much! 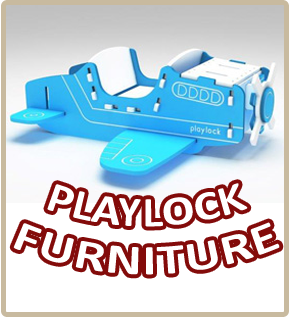 Playlock is a line of sturdy kids’ furniture that you and your children will really enjoy owning. Not only is it made in a fun design, but many of the pieces have multiple purposes, allowing your kids to play with them and use them to organize other toys and books. Pretty cool, huh? The Playlock range of indoor kids toys and organizational furniture is unique, sturdy, useful and so much fun for kids. The piece of furniture you order will be shipped to you flat with clear instructions on how to assemble. You will not need any screws or glue, as the pieces lock together, almost like a 3d puzzle. Your kids will use the Playlock Toy Box to keep their toys off of the floor, cleaning their playroom or bedroom clean. They can organize their books on the Joey Shelf or the Large Kangaroo Shelf, or put their dolls and stuffed animals on them. Teaching kids to clean up after themselves early in childhood will help them develop a lifelong good habit. And with Playlock, they will have fun doing it! Playlock furniture are great toys for pretend play. Did you know that pretend play teaches your kids a ton of great things? One of those things is overcoming fears. Childhood fears are hard to overcome, but pretend play helps. It takes a safe environment to test our limits. Having your own fun toys to play pretend with will give them that spot to challenge their fears and put their bravery to the test. After all facing down lions and tigers and bears while riding their elephant chair in the jungle or snow monsters on their dog sleigh can be pretty scary. But your child will figure out just how to overcome their fears during their pretend play games with Playlock! Take a look at our whole line of Playlock furniture, you’ll find reasonable prices, sturdy pieces and tons of fun for your kids.